This decklist was built for a friend who's like a sister to me. She requested a discard deck that can work at the Multiplayer table. 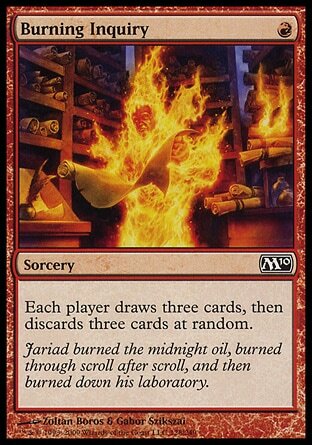 I immediately thought of splashing Red since it seems to have the best options for causing multiple players to discard several cards at a time. This deck has been tested a hefty number of times and it's a force to be reckoned with. It's capable of causing a whirlwind of destruction with ease. As an added bonus, it's incredibly powerful in Two-Headed Giant. Pyroclasm (or any of its variants such as Volcanic Fallout) takes care of any early threats or token armies that might want to give you any trouble. Vampire Nighthawk shrugs off Pyroclasm and can keep the big nasties off of you. 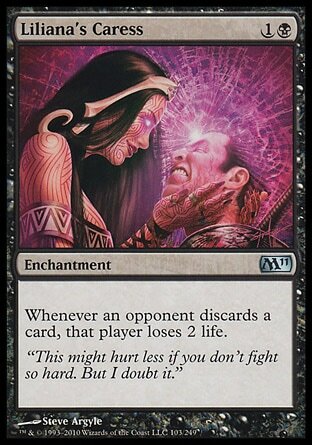 Terminate is a cheaptastic spot removal spell to deal with any major threats and if it isn't your style then you might want to test out Agonizing Demise (and similar cards such as Traitor's Roar) which can blow up opponents that get greedy by pumping up massive creatures. All in all, a well rounded defense for the entire multiplayer table. Quest for the Nihil Stone gets the only two counters it needs without even trying and can be devastating in later turns, especially with multiple copies on the field. Liliana's Caress is one of the main setup pieces that's rather obvious in its application. Geth's Grimoire draws more than you'd imagine since you'll be forcing multiple opponents to discard multiple cards. This ensures that you'll draw your key cards as well as a thousand extra. Remember kids, card advantage is king. 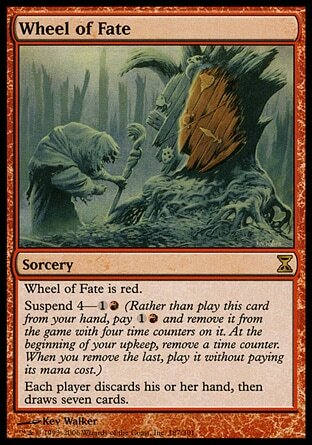 Burning Inquiry, Wheel of Fate, and Syphon Mind all force each opponent to discard their prized possessions. They also activate all of the setup cards in the deck. Myojin of Night's Reach is a brutal finisher if the game somehow manages to last long enough that she happens to be necessary. Liliana Vess was added in simply because it does everything the deck could ever want. Her first ability is repeatable discard, her second ability can tutor for setup pieces or discard spells, and her final ability can be an alternate win condition after forcing all of the players at the table to discard so many cards. This is Kylak signing out and discarding all the things!